Hawaii's only Farm To Table experience! Locally grown and sourced foods with a menu of items fit for royalty! Join us on an incredible journey of music and dance throughout Polynesia, culminating in an epic fire-knife dance spectacle! Greeted with lei, enjoy a full bar, cultural activities and a spectacular sunset that only Waikiki Beach can provide! An award- winning Polynesian revue show travels to Tahiti, Samoa, Tonga, New Zealand and Hawaii. guests will be visually stunned by the champion knife performers skills and abilities as they perform the much anticipated "Siva Afi!" The Diamond Head Luau is located at the historic Waikiki Aquarium and admission to the aquarium is included with all packages. Upon check-in guests receive their seating assignment and drink tickets. Guests will be met with a traditional lei greeting before have their photograph taken by our on staff photographers. Photos are for sale for Standard & Deluxe package guests and are included with the VIP package. Walk through the interior aquarium displays before exiting onto the luau grounds. Here guests are welcomed this time with a Mai Tai or fruit juice. Along the grounds guests can enjoy an array of cultural activities such as lei making, coconut weaving, hula lessons, ukulele lessons and Polyniesian tattoo. At 6:15pm our Hawaiian style buffet dinner begins. VIP guests will enjoy table service, while our Deluxe and Standard package guests will help themselves to the buffett line. The menu is a blend of traditional Hawaiian staples such as kalua pork and poi, along with local style foods such as lomi lomi slamon and teriyaki chicken. See below for full menu details. At 7pm the lights dim and you will travel on a musical journey through Polynesia. 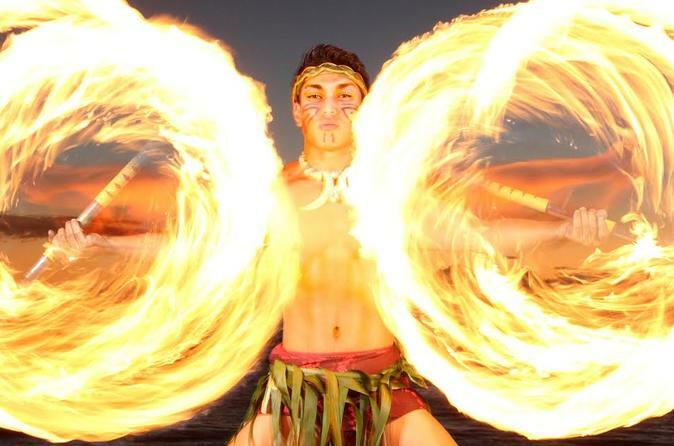 Performers will showcase traditional and modern numbers from Tahiti, Samoa, Tonga, New Zealand and Hawaii, with a grand finale of Siva Afi, or fire-knife dance, featuring our very own world champion! The show will conclude at 7:45 and guests are free to leave at their leisure or peruse the aquarium, as it will remain open until 8:30pm exclusively to guests of the Diamond Head Luau!